If you’re any kind of modern Doctor Who fan, at Christmas 2017, you saw Peter Capaldi’s Twelfth Doctor (Don’t let’s quibble of Doctor numbers, shall we?) 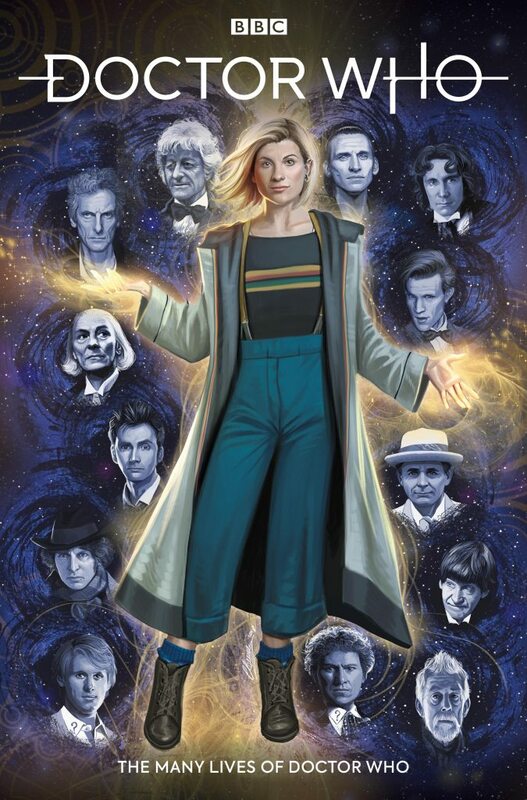 into Jodie Whittaker’s Thirteenth. You heard Capaldi’s dying Doctor give a speech to his incoming self, about pears and kindness and running, and letting the Doctor go. But once he stepped into the regeneration stance, and the artron fire exploded from his body, we heard no more from him – no screaming, no words. His giving up and becoming someone new was done in silence. Not any more it isn’t. In its conception, then, it’s a thing of beauty, a love-note to long ago from the Capaldi Doctor, and a welcome and a hope for the future, shown to us while the artron fire rages, and the moments immediately afterward, when the voice in the Doctor’s head is still the old, the dying Doctor’s. It’s enough to make more sentimental fans go gooey, frankly. Shurrup, you’ve got something in your eye. If there’s a flaw in this plan, it’s that the 69-page comic book really isn’t long enough. Facetious? No – Thirteen Doctors, including the War Doctor, in 69 pages, along with the glorious framework of regeneration, allows writer Richard Dinnick really very little space to make his mini-adventures work, and there are a few that feel like they’ve had their innards ripped out – the Second Doctor story in particular feels short-changed, and the Seventh Doctor tale starts with a wonderful premise, and devolves into a conclusion which is ‘I must remember to do the thing I said I’d done so I can defeat the villain.’ There are others too where there’s a hefty dose of ‘Hours later…everything’s sorted,’ which can give you a sense of not so much a love letter to the previous Doctors as a postcard, which starts out wild and expansive and quickly has you writing extra-small in every conceivable scrap of space. But there are jewels aplenty here. There’s an explanation of how the Time Lords are able to grant new life cycles when they want to, for instance. There’s a story which flips the bird to some of the female-Doctor haters, entitled Nurse Who? The Seventh Doctor story, as we say, is brilliant as an idea – but might have been better with the addition of a new version of Kamelion (You want to know now, don’t you?). There’s what reads as the first encounter between the Doctor and Dorium Maldovar – bananas included. There are celebrity historicals, there’s River Song, there’s a glorious call-back or two to one of the best Dalek stories in the show’s history. Jewels, all of them. And yet perhaps the most precious thing in this comic book are the last thoughts of the Twelfth Doctor, which are written with extreme care and a truthfulness to his tone of voice that’ll make your hearts ache. Perhaps a little ironically, over 69 pages of celebration of ultimate Doctoring, it’s the new perspective on the most recent event in Who history that’s the biggest, brightest-shining diamond of all, the best celebration of what it means to be the Doctor. In terms of art and colour, Titan’s amassed a roll call of champions for this release, and yet what’s interesting when you read it is the sense that, whether intended or not, most of them have nailed not photo-realism, but the kind of artwork that used to feature in the Doctor Who Annuals of their various eras – The First, Third, Fifth and Sixth Doctor stories certainly have that vibe, and, for older or more nostalgic fans, that’s a wonderful extra gift. It’s as though the Doctor’s memory itself files his and her previous lives and adventures as these kind of comic book renderings, compared to the more photo-realistic memories of the now and the recent – the Twelfth Doctor’s regeneration sequence is replicated here almost scene for scene, and where it is, it’s sharply rendered rather than comic book-remembered.